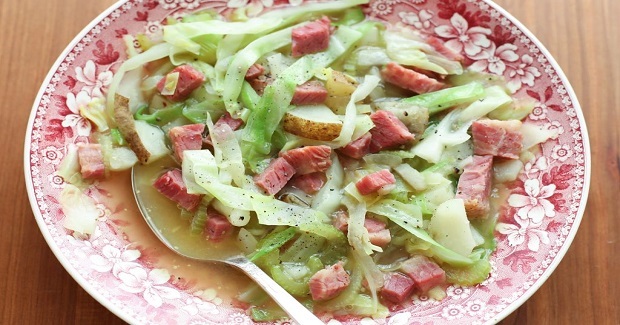 Corned Beef And Cabbage Stew Recipe - Gutom Na! Posted on Monday, March 6th, 2017 at 1:10 pm. Heat the oil in a large pot over medium high heat. Add the onion and begin sautéing it while you slice the celery. Add the celery and cook together until almost tender. Slice the potatoes and the corned beef and then add to the pot along with the broth, Worcestershire and pepper. Bring to a boil and then reduce to a simmer for about 10-15 minutes, until the potatoes are tender. While the stew is simmering, slice the cabbage. When the potatoes are tender, add the cabbage and stir for about a minute to soften it slightly. Remove from the heat and serve. Enjoy!